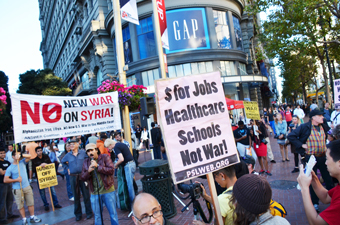 Jobs, Healthcare, Schools, Not War. buckle under shock and awe campaigns waged by the U.S. military and her allies. But often lacking is portrayal of the damage America’s wars cause to citizens in her own backyard. The drumbeats to war have again started with the president’s declaration of plans to strike Syria militarily for alleged use of chemical weapons against civilians—claims which have been disputed in many quarters. “It’s going to mean what war always means to the American people. It’s going to mean that while the politicians are telling us that the country’s broke and we have to cut public schools, we have to cut social services, and access to health care and so forth, that billions and billions and billions of our tax dollars are going to be thrown away in the form of Cruise missiles and high powered missiles launched to a country against people that we have no reason to be fighting,” said Michael Prysner, an Iraq War veteran and member of A.N.S.W.E.R. Coalition (Act Now to Stop War and End Racism) in Los Angeles, when asked about war talk and Syria. He joins the voices of millions who argue Syria poses no threat to America. The claims of humanitarian intervention there are just as bogus as the claims of humanitarian intervention when the U.S. went into the Iraq War, Mr. Prysner insisted. “This is a war where the U.S. government wants to assure the American people that the bleeding only has to happen on one side. No Americans have to die. ‘Only these evil Syrians have to die,’ which is just such a racist characterization of a war,” Mr. Prysner continued. As Americans will be experiencing hardship in this country, they’re going to be watching money that could be spent on human needs here sent to kill their brothers and sisters in Syria, he argued. 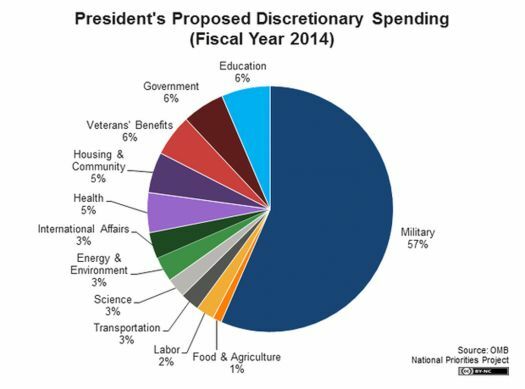 President Barack Obama has allocated more than half ($652.99 billion) of America’s $1.15 trillion discretionary spending budget for 2014 to defense, according to the National Priorities Project. In March 2013, the government began automatic, across the board trillion dollar cuts across to help reduce the country’s deficit. Cuts to education alone amounts to approximately $3 billion, according to the National Education Association. The cuts amount to a loss in services for millions of students, as exhibited by 50 school closures in Chicago, a loss in funding for children living in poverty, less funding for special education, financial aid for college students, after school programs, and tens of thousands of jobs. 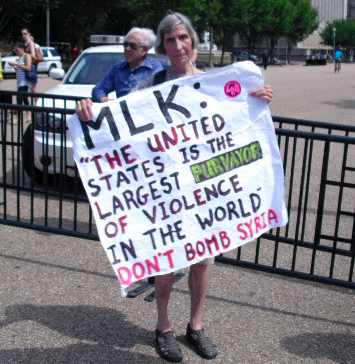 “While we need to be protesting, we need to be in the street doing what we can to influence the domestic calculations of the U.S. government as they prepare to go to war, really, what happens in moments like this, the system is exposed for what it is,” an imperialist system of endless war for empire, Mr. Prysner told The Final Call. Anti-war activists told The Final Call that as the U.S. threat to move Syrian President Bashar al-Assad out of office heightens, people must understand what costs Americans will pay for an unjust war. Carlos Montes, an anti-war and labor union activist, Chicano leader and member of the Committee to Stop FBI Repression, told The Final Call the threat of bombing Syria is unjustified, morally and political wrong, and has nothing to do with human rights violations. Such money could be used to relieve unemployment, lower incarceration rates for Black and Latino men and women, create jobs, and fund education, infrastructure development and housing, he said. “I could go on and on about the high unemployment and lack of healthcare and other problems, but all of that money that we’re paying in our federal income taxes should be used to come back into the community for human needs not for war,” Mr. Montes told The Final Call. “You have to understand that war is good business for the military industrial complex,” said Prathap Chatterjee, executive director of Corpwatch, a non-profit organization which works to expose corporate wrongdoing. With the war ended in Iraq and winding down in Afghanistan, and questions being raised in Pakistan, the Pentagon and intelligence budget has been cut, Mr. Chatterjee noted. But, while contractors are cutting back, they’ll benefit along with the Pentagon if spending rises due to war with Syria, he said. “Military spending is largely going to hiring computer analysts to sit and go through citizens’ e-mails and build large computer systems to vacuum up stuff,” according to Mr. Chatterjee. “Why in the hell are we spending $50 billion in the official intelligence budget, plus another $20 billion or $30 billion in hidden budgets if they’re not coming up with anything? Well, they’ve got to be able to prove that Bashar Assad has been using chemical weapons,” he explained.